FIGMENT First Night is Coming! This New Year’s Eve, 7:30 p.m. to midnight, join FIGMENT Boston in celebrating with our creative community and First Night Boston helping to make a special, event within an event, and an experience like no other before in Boston. FIGMENT First Night will be a warm, bright light in the heart of the city with fire performances and innovative, participatory art projects that will spark your imagination! FIGMENT demonstrates what the arts can be: interactive, creative and free, born from the desire to share imagination and invention between artists and the public. FIGMENT First Night will take place on the Boston Common, publicly accessible and ideally located near the Park Street MBTA station and dozens of major attractions in downtown Boston. In keeping with the spirit of FIGMENT, FIGMENT First Night is completely free and open to the public. * Please stop by the info booth when you visit us on New Year’s Eve as projects and placement are subject to change. Riskeeball – What could possibly be better than Skee Ball? How about fire-erupting Skee Ball topped with air horns to signal special game modes?! This reimagined arcade staple will blast fire whenever some serious celebrating is in order so come play Riskee Ball on the Boston Commons at FIGMENT First Night! Toxic Bloom – an interactive fire sculpture that manifests participants’ movements and gestures into bursts of different colored flames! You may have played with it at other art festivals, including Burning Man, Firefly Arts Collective‘s regional burn, False Profit, LLC‘s Priceless, and other Figment Boston events. We’re so excited for all the fire art at FIGMENT First Night! 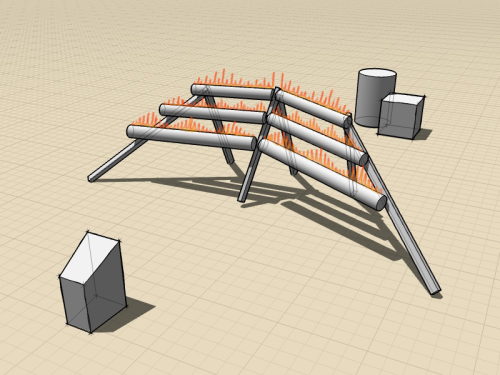 Hearthbeat – an interactive sonic fireplace that changes shape and dances in concert with sound. By singing, using a synthesizer, or drumming out rhythms via touchpad, your music creates dramatic wave patterns in the flames! Video Bleep - a dome with 360 degree video projections and surround sound creating an immersive audio-visual experience. Your mission – take control of perception by manipulating frames of reference and changing the speed, color, and brilliance of the video projections via joystick. Let’s use this extra­sensory canvas for audio­visual art of mind­blowing dimensions! Moth Machine - a psycho-strobic animated sculpture with 16 moths flapping and flying overhead, playing tricks with your senses so they appear as one. Be aware as you enter the moth’s sonic field and become hypnotized by a sculptural amplifier dubbed the “hypnosis machine,” powered by a custom built Masco tube amp and consisting of a rotating “leslie” speaker chopped from an old organ and repurposed vertically with a hypnotic spiral wheel designed to disperse sound in a slow circle. Play with a mic, live instrumentalist, or the variable speed motor and strobes to create colorful effects and illusions with this surreal piece of art. Quetzalcoatl – an interactive sculpture of the Aztec God, a feathered, flying serpent purported to have a hand in the creation and destruction of the universe. If you play with this ancient dragon, it will magically come to life with changing colors, light patterns, and sounds. on this sculpture to create iridescent patterns of light, refracting like the surface of water. Fire Safely - In this interactive light installation, you manipulate the “fire” with your movements. Contort, dance, flail and twirl about madly. Fire Safely guarantees every budding pyro can stoke their innermost flames without fear of getting burned. Discomatic – an interactive installation allowing participants to make their own light and sound performance by dancing and stepping into the different colored squares. CEMI going to get us shaking it like it’s hot on the Discomatic dance floor this New Year’s Eve! Galactic Night - On the Common at night there are two separate sources of light – the eternal points of light in the sky and the temporary lights of our earthbound creation. One of these temporary lights captures the Cosmos and represents it to us on a more human scale. It manifests our celestial birthplace; the Milky Way, our Galaxy, our Home. Arc Lights - First Night revelers walking into the Common will be captivated by this fanciful, interactive sculpture that turns the pedestrians’ movements into dancing fireflies and shimmering star flights! Play with Arc Lights to learn how movements combine to make the lights dance and appear to move through the air, changing appearance, color, and rhythm over the course of the night to reward those who visit multiple times. Light Tubes – a forest of light tubes for us to wander through on the Boston Commons. Sandtrap – a glowing sandbox for kids of all ages to express themselves creatively in a collaborative and visually engaging setting. Choose Your Own Fairy Tale - The Dark Follies, a troupe of six musicians and four variety show performers, will present two of Grimm’s Fairy Tales as street performances that include live music, song, dance, and flow arts. Though the tales will begin as familiar and well loved stories, at critical points in the plot the question of what happens next will be put to the audience to decide which option the character chooses. There will be 4, 15min shows, starting on the hour 8:00-11pm. Builtogether - facilitates a space for strangers to come together and build something new out of large glowing blocks. Participants can photograph their unique structures and submit them to Builtogether (builtogether.tumblr.com/submit or builtogether@gmail.com) so they can appear on a live blog. Warmth – Performers will offer the service of warmth via handcrafted heat harnesses mounted on their bodies. It’s going to be cold outside so stay warm with a little help from your friends at FIGMENT First Night! Temporeal - an ongoing project that explores the animation of otherwise mundane and static material by applying the concept of the wagon-wheel effect in a sculptural format. Utilizing the precision of sound, we can control a surreal behavior of just about any material! Trees of Life - explores the magical sculptural, educational, expressive and interactive life of trees wrapped in large skins of vividly colored Lycra/Spandex painted to glow in the dark. The textures, drawings, and materials make a unique and fun installation art piece, creating spaces within spaces, as well as backdrops for other participating art pieces. Baby Carriage - a giant, 10ft tall baby carriage that’s pedal powered! While stationary it fits several people, accessible via a fold-down ladder, and inside, people can sit on pillows, pretend to drive, or take pictures. Land Rover Chalk Safari - Gather around and bring the heat of the African Savannah into the cold, dark, New England Winter. Draw chalk animals onto an actual 1962 Land Rover. Transform this iconic safari vehicle into herds of gazelles, zebras, giraffes, hyenas, lions, rhinoceri, you name it. We supply the chalk and the Land Rover, you supply the imagination and artistic talent. Fish Car - made of recycled metal and wood and a recycled 1990 Dodge Omni saved from the crusher where not only most of the parts of the car would be wasted but most of the energy, materials and time spent producing it would be discarded and added to the ever-growing waste from our industrialized world. Nearly everything we own and use daily can have a second life.